Kafein, 1621 Chicago Ave. Every Monday night, Kafein holds an open mic night with acts ranging from music to stand-up comedy. There were only about 10 people at Kafein’s open mic on Monday night, but that didn’t stop comedian Nick Dlouhy from playing with the crowd, gathering feedback. “That was new, how’d you like it?” he asked the room after trying out a joke. When he only got one response amidst laughter, Dlouhy was unphased. The weekly open mic, hosted at Kafein on 1621 Chicago Ave., welcomes original acts ranging from music and poetry to stand-up comedy and story readings. Open mic host John Lamm said the mission of the program is to provide a sense of community and give artists room to grow their craft. 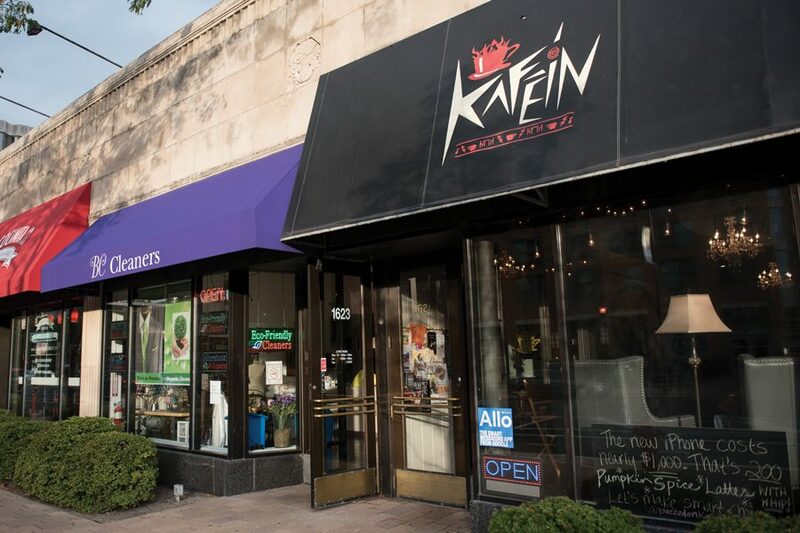 Lamm said he first encountered Kafein during his junior year of high school, when he moved from Logan Square to Evanston and enrolled at Evanston Township High School. Now, a little over a decade later, he’s been Kafein’s open mic host for about six months, taking over after previous host Brandon Cummings became the owner of the cafe. Kafein is enforcing a new policy requiring original content after the American Society of Composers, Authors and Publishers shut down the open mic for several months last year for performing covers without proper licensing. Lamm said the program is back under the condition that no copyrighted material is performed until proper licensing is obtained. Performers and audience members generally hail from the Evanston area, though regular performer Pierre Compere said people have come from as far as Wisconsin to perform. Compere, who closed the show playing electric guitar in a fluffy red hat, said he is a full-time professional musician, but most of the performers at the open mic have day jobs outside their performing arts. Dlouhy, who said he has been performing at Kafein for over two years, currently works as an instructor for a software company, though he said he dreams of making a full-time career of stand-up. As he prepared for his set, jotting down ideas in a notebook, he said he sees Kafein as a workshop space. Audience member Sofia Garcia-Sanchez, who recently moved from Florida and is now living in Chicago, said it was her first time at Kafein. Garcia-Sanchez added that she found out about the event by searching for poetry events online, and added that she definitely plans on coming back. Lamm said the open mic is usually packed, and he speculated that Monday’s 5-degree weather was keeping crowds away. Still, the performers were undeterred by the small turnout, taking the opportunity to joke with one another and try out new material.